Silverchair is a rock band from Newcastle, Australia. The band's members are Daniel Johns, Chris Joannou and Ben Gillies. 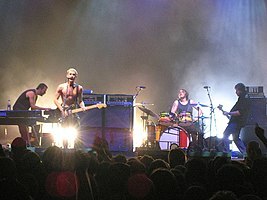 Silverchair is the only artist to score five number-one albums in the Australian Charts. Their studio albums are Frogstomp, Freak Show, Neon Ballroom, Diorama and Young Modern. The band has released many singles, their number-one singles are "Tomorrow", "Freak" and "Straight Lines". This page was last changed on 21 June 2018, at 06:05.